Football Team Drops Home Opener | The Gettysburgian. The Gettysburg College football team fell in their opener 34-17 on Saturday at Shirk Field against Bridgewater. Sophomore quarterback Mike Welsh played his first game in a Gettysburg Jersey, completing 15-of-35 passes for 199 yards and 2 touchdowns. The offense needed a few drives to get in rhythm, but it came together in a great drive to score 7 and end the half. “Offensively we have an experienced offensive line and then we have a lot of new guys at a lot of spots,” said Burke. The young offense put up 276 yards on the day. On the ground, senior Nick Rella led the backs with 9 rushes for 31 yards, while on the receiving end, sophomore receiver Joey Razzano brought in 3 balls for 58 yards and a touchdown and senior receiver Johnny Davis also caught 3 balls for 57 yards. Defensively, Burke thought his team played well. “Our defense did a phenomenal job of not letting up when we were struggling with field position,” he said. Junior inside linebacker Cole Keyes led the defense with 11 tackles. Senior defensive end Logan Aikey racked up 2 tackles-for-loss and a sack. In the back, sophomore Thomeir Richardson played lockdown defense and finished the game with one interception and three pass breakups. The first half was a game of field position as the Bullets started 5-of-7 drives in their own red zone. In the first half alone, Gettysburg’s defense got two takeaways and held Bridgewater to just 126 total yards. Bridgewater scored early, capitalizing on a miscommunication for a 52-yard pass and followed with a 9-yard pass to go up 13-0. The half ended with a scoring drive led by sophomore Mike Welsh. In nine plays, the Bullets marched down the field and ended with Welsh completing a corner route to senior Chase Fee to make the score 13-7. Most of the yards on the drive came from a short curl route to sophomore tight end Joey Razzano who made the defenders miss and picked up 22 yards. The second half was another defensive battle as the first four drives didn’t make it passed a three-and-out. Early in the third quarter, sophomore Thomeir Richardson warded off a touchdown and picked off opposing quarterback Jay Scroggins. With 4:51 left in the third, Bridgewater’s Matt Dang jumped a curl route and returned the pick-six for 41 yards making it 20-7. On the very next drive, the Bullets capped off a solid nine-play drive with a field goal from junior kicker Justin Geisel. Bridgewater responded quickly, faking a speed sweep and running up the middle for 52 yards to make the score 27-10. 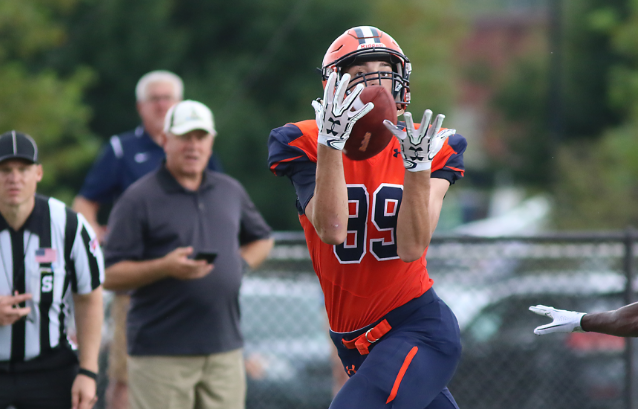 Taking over with 12:22 left in the fourth quarter, Gettysburg put together a successful drive of 11 plays and 89 yards, capped off with a 25-yard pass from Welsh to Razzano to put the Bullets back within two scores. Bridgewater put the game out of reach a few minutes later with a touchdown of their own. Despite the loss in their opening game, Coach Burke remains at ease. The Bullets start Centennial Conference competition this week at Ursinus on September 8 at 1:00 pm.